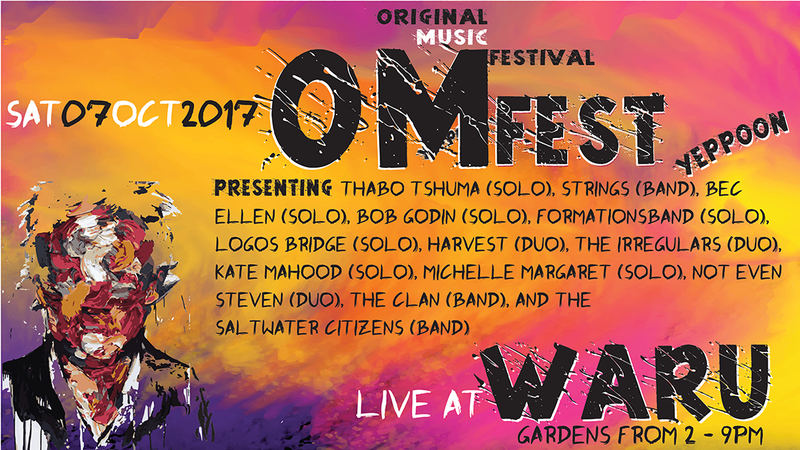 Are you ready for OMFest 2017? It's coming soon! Saturday 7 October 2017 @ Waru Gardens. Register your interest to perform original music at this at this iconic annual event. Several bands and solo artist lined up already. Stand-by for more announcements. OMFest, otherwise known as the Original Music Festival, is a grassroots music festival staged once a year in the intimate and tranquil Waru gardens at the edge of Yeppoon on the Capricorn Coast. ​Since its inception in 2005, OMFest is organised by a private group of dedicated original music artists and numerous volunteers and has become recognised as a key music event on the Yeppoon events calendar. The festival boasts two stages operating through the afternoon hours and presents great bands including new bands and some debut performances that can be really surprising. It's got everything, a festival just sort of jammed into one day, one afternoon. Community is the key to the festival's success. Everybody donates their services, including the Keppel Coast Arts Council and Radio NAG, and there are stall holders and food vendors on site, too. ​Are you ready for OMFest 2017? OMFest festival organisers are calling for artists now! If you play original music, have a passion for open air performance and enjoy a relaxed atmosphere then it's time to contact us so you can be included in OMFest 2017. Have a band that plays original music? Would you like to have a song on a compilation CD? Want to experience the recording process? Network and collaborate with other local musicians? Limited time frame & number of places available. Get in quick!